The banking network is shrinking, and it is bad news for businesses. 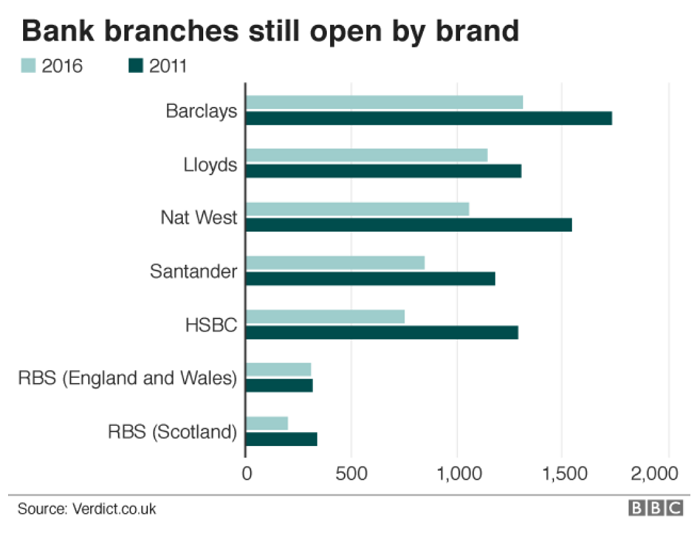 This continues an ongoing trend that has seen all major high street banks reduce their footprint on those same high streets (see graph below). We’ve reported before that 802 branches closed in 2017 alone. Some 1,500 towns had become branchless according to a 2016 report from the Federation of Small Businesses. Why does this matter to Britain’s businesses? Government ministers warn of financial exclusion. The term ‘financial exclusion’ normally conjures up images of the socially marginalised – the elderly, sick, unwaged with no access to bank accounts, loan sources and the like that the rest of society takes for granted. ‘Financially excluded’ and ‘SME owners’ are terms you wouldn’t normally put together. But it is happening. 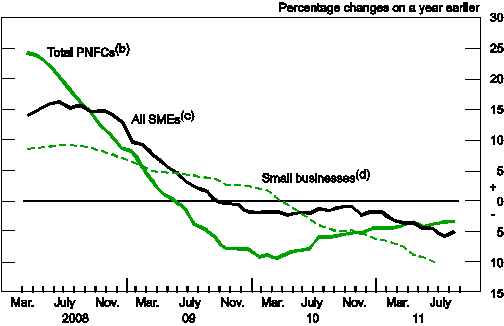 The reduction of bank branches is indicative of a commensurate reduction in other services – in this instance, provision of loan capital to SMEs. The problem is, the reduction of banking staff means a reduction in skills. You can’t replace everything with a nifty algorithm. 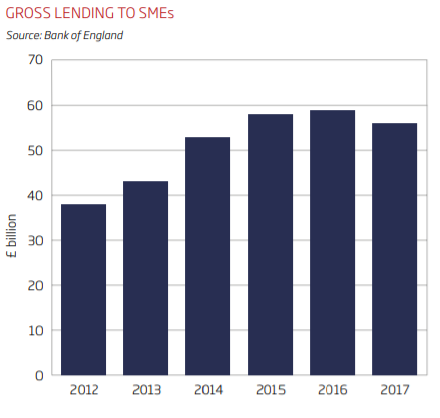 Some 12% of lenders didn’t understand the SME sector and a further 10% didn’t have the necessary understanding of borrower’s individual needs, according to Close Brothers. Only 20% of SMEs believe their bank’s advice always meets their needs. This dynamic – or lack thereof – saw bank lending collapse in the wake of the financial crisis as banks, caught in the eye of the storm, attempted to repair their balance sheets (see graph below). ​​​​​​​After this, regulators – never ones to miss the opportunity to securely bolt a door once the horse is well over the horizon – imposed strict risk controls on their lending. While the chart below demonstrates that bank lending has recovered somewhat, it’s still below pre-crisis lending levels, regulation means that levels are unlikely to return to what they were more than a decade ago. Indeed, as you can see from the graph below, gross lending declined year on year to 2017. The landscape has fundamentally changed, and a space has opened up, probably permanently. While the Deloitte study optimistically states that “2018 will bring about dramatic changes in small business lending” as a result of General Data Protection Regulation, which compels banks to share this data with any authorised third party, meaning “more lenders, better credit decisions, and fewer bad loans”, this should come with heavy caveats. Banks will still have the same lending constraints. 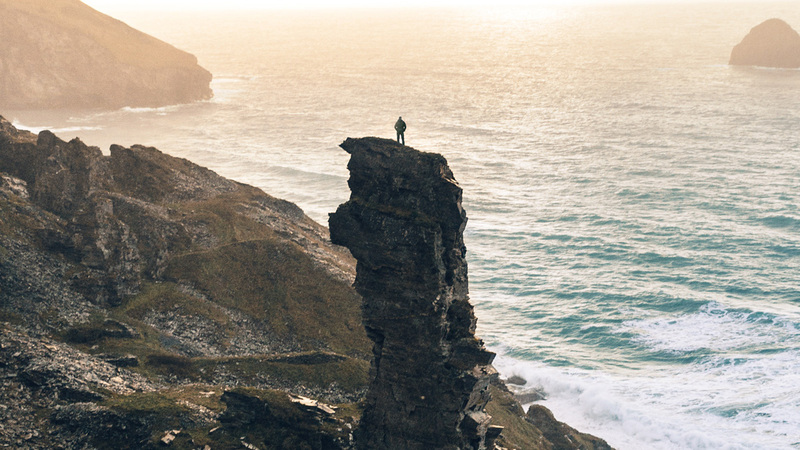 What’s more, quantitative data on which to base lending decisions will be more available, but one must have the skills to interpret the information and the operational freedom to act on that interpretation. The combination of reduced resources – indicated by falling branch numbers – and restrictive regulation pen banks in on both sides. Fortunately, while traditional lenders are hemorrhaging resources, alternative lenders – like us – are developing them. We know that no two businesses are exactly the same, and hands-on expertise is needed to determine the best way to structure an SME loan. ThinCats has been expanding its business development team to ensure that we can offer businesses loans that suit their needs, because we understand those needs. Even with a greater breadth of data, there’s still a strong likelihood that banks’ computers will still say no, or offer capital on terms that may make business owners wince. The good thing is, there’s now an alternative.